In honor of Women’s History Month, Clark Partington offers a mini-series focused on inspirational women. The featured quotes and the women who spoke them have had an impact on the authors of these blogs. In each blog, you will get to know the influential women in history, as well as Clark Partington attorneys. This third blog was authored by Cameron Townes Gore and Melissa Painter as part four of a mini-series focused on inspiring women leaders. We hope you will be inspired, too! Sandra Day graduated from Stanford University in 1950 and Stanford Law School in 1952. After graduation she married classmate John Jay O’Connor III. Despite graduating near the top of her law school class, she could not find work in a law firm as an attorney because she was a woman – although she was offered work as a legal secretary. She took a job as Deputy County Attorney in San Mateo, California for a brief period of time before moving to Germany with her husband and working as a civilian attorney for the United States Army from 1954 to 1957. Upon her return to the United States, Ms. O’Connor engaged in private practice before taking some time off to spend with her children and to do volunteer work after the second of her three sons was born. She then served as Attorney General of Arizona from 1965 to 1969 before being appointed to the Arizona Senate in 1969 to fill a vacancy. She was twice reelected on her own to the Arizona Senate and became the first woman to serve as Arizona’s or any state’s Majority Leader. Ms. O’Connor was then elected to the Maricopa County Superior Court in 1975 and appointed to the Arizona Court of Appeals in 1979. In July of 1981, President Ronald Reagan nominated her to the Supreme Court and she was confirmed unanimously by the Senate and sworn in as the first female justice on September 25, 1981. She served on the Supreme Court for twenty-four years retiring on January 31, 2006. In 2009, Ms. O’Connor founded the Sandra Day O’Connor Institute to continue her lifetime of work to advance civil discourse, civic engagement, and civics education. Sandra Day O’Connor inspires us by her perseverance and dedication to civic engagement and reminds us of the important role that the leaders of today play when they turn around to lend a helping hand to the leaders of tomorrow. Cameron Townes Gore joined Clark Partington in 2015 as an associate in the firm’s Pensacola office. 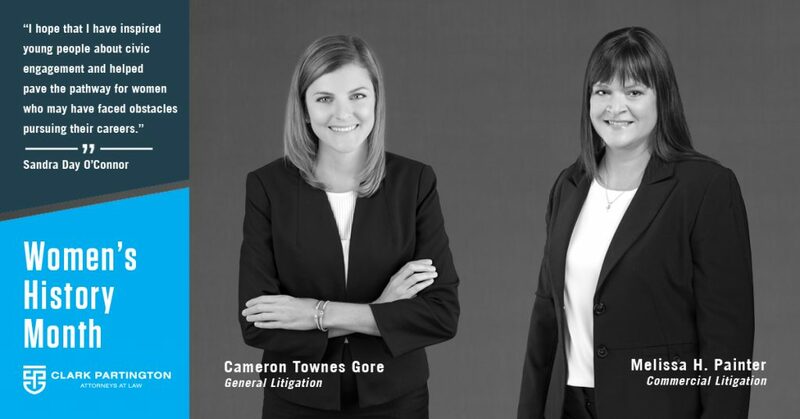 Cameron’s practice primarily focuses on general litigation, construction litigation, and construction lien law. While in law school, Cameron was an active member of the Dorbin Association Women’s Legal Society and served as the organization’s Secretary and President. She also worked as a Certified Legal Intern in the University’s Domestic Violence Legal Clinic and won the 2015 Clinical Student of the Year Award for her participation and outstanding performance in the Clinical Program at Alabama. Cameron Townes Gore is licensed to practice in Florida and Alabama. Cameron can be contacted at cgore@clarkpartington.com or 850.208.7031. Melissa H. Painter is an attorney and shareholder in Clark Partington’s Pensacola office. Melissa strives to always be available to her clients and to keep them informed about their case with honesty and directness. Melissa joined Clark Partington immediately after graduation from law school, and practices in the areas of real estate litigation and mortgage foreclosures. Melissa’s clients include lending institutions, title companies and their insureds, and individuals with regard to various disputes involving the title to real property. Melissa H. Painter is licensed to practice in Florida. Melissa can be contacted at mpainter@clarkpartington.com or 850.208.7032.